After Dark 8 is a show celebrating darkness and the varied reactions emblematic to this subject matter…nighttime, dark humor, dark fantasies, dark matter, etc. Greg Moon Art of Taos hosts this national show in March. 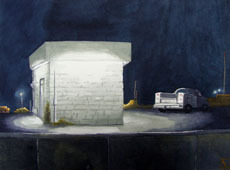 The show will run March 23rd – April 13th with an opening reception on the 23rd. Taos Art Insurgency is a show that poses the questions: Who will be the artists that lead the way for the new millennium? What will be the movements and issues they champion? Taos is a major artist’s colony that has been at the forefront of all of the modern art movements initiated within the last 120 years. Throughout history various seminal art movements have been concentrated in this sleepy, little, mountain village. Taos has been a major seat of Modernism, Abstract-Expressionism, and Minimalism. David Anthony Fine Art, Wilder Nightingale Fine Art, and Greg Moon Art of Taos host this national show in conjunction with the Taos Spring Arts Festival. The show will run April 27th – May 18th with an opening reception on May 4th. Entries are being accepted in painting, drawing, printmaking, photography, sculpture, mixed media, fiber arts, digital printed media, and assemblage. Entry deadline is midnight April 3rd. All entries must be submitted through the callforentry.org platform. For additional info call 575-770-4463 or visit https://blog.gregmoonart.com/taos-art-insurgency.